Your title is a very cute play on the fairy tale “happily ever after”. Do you use fairy tales as inspiration for any other parts of the book? There is a little fairy tale inspiration here and there. Things like magic wands flashing to make life perfect, and finding prince charming. The fairy tale idea came because my husband and I are always joking about how every Disney princess comes from a dysfunctional family of sorts but somehow they always find their ever after. Beauty and the Beast is by far my favorite. I think maybe it’s just because I like the music, but I do think Belle is beautiful for an animated character. The entire show just pulls me in. It’s almost and edge of your seat fairy tale if you ask me. 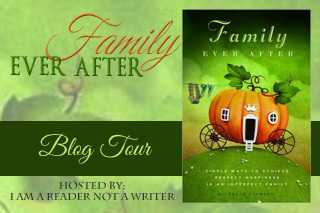 What was the hardest part of writing Family Ever After? The editing process was very difficult. It was hard to content edit. The` book is so much a part of me and who I am, that when changes had to be made it felt very personal. What is it about your book that makes you the most proud? I think what makes me feel most proud is that as I enacted the principles in the book with my own family and spouse it really made our marriage and family better. I discovered something that really can help families be happier and that is exciting to me. Do you have any funny habits for when you’re writing? There are a few silly things, like I won’t let anyone read my first draft…EVER, and when the writing gets stressful, I rely heavily upon Nutella. It is my favorite. What is the most important thing you would like for your readers to take away from Family Ever After? I think it is so important to remember that no matter what family path we are on, it will be hard. In the words of my aunt, “It is hard to be married. It is hard to have children. It is hard to be divorced. It is hard to be single.” Life is hard no matter what path we choose, but we can always choose to be happy. What a great book cover! Congrats to Michelle!